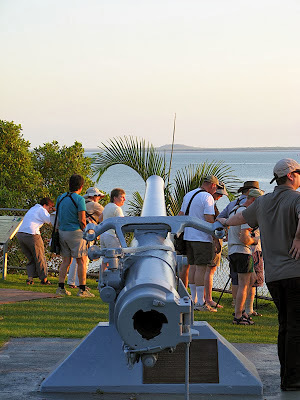 On any visit to Darwin, 2 things stand out vividly from its history. One is Cyclone Tracy and its effects on the city, and the other is Darwin's importance to Australia as its front line during WW11. 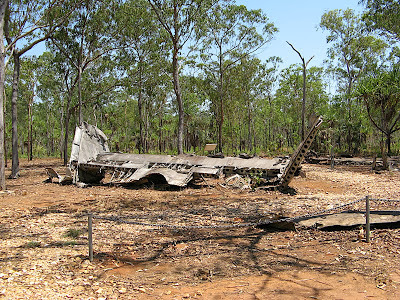 The tragic events surrounding Cyclone Tracy are very well commemorated in the Museum and Art Gallery of the Northern Territory at Fannie Bay. WW11 events and actions are represented in the many military and aviation museums and memorials around Darwin, and one in particular we found very poignant. 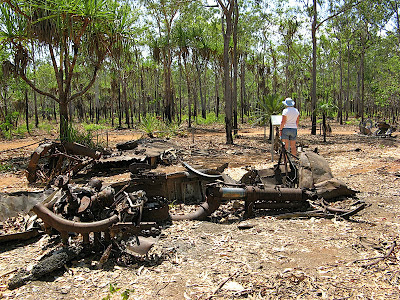 In a previous article on the Corunna Downs secret airbase I mentioned the sad case of a crashed WW11 bomber near Mandorah on the Cox Peninsular, west of Darwin, in which 6 young American airmen died. 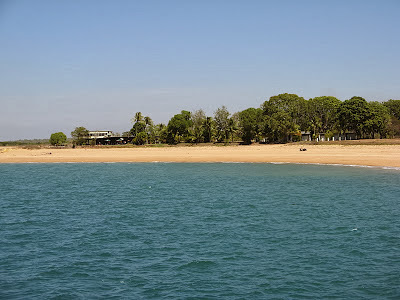 Just a 12 minute ferry ride across Darwin Harbour from Cullen Marina lies the sleepy township of Mandorah. 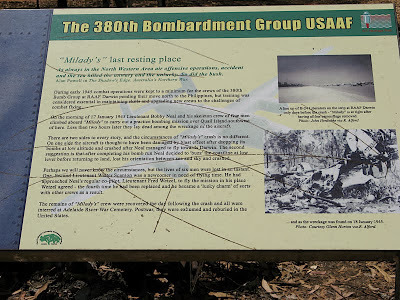 And just a few minutes ride from there (8km, take a pushbike or motorbike on the ferry, it’s too far to walk in the heat), you can visit the crash site of a USAF Liberator bomber, the Milady. You can get a feel for the crash location by visiting the site on Google Earth at 12° 25.933'S, 130° 41.803'E. 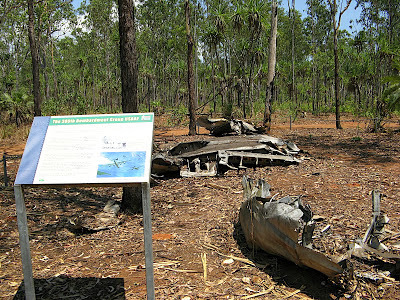 Also check out the CMCA GeoWiki entry: Historic Sites, Liberator Crash Site at Mandorah. The story of the demise of the Milady is particularly tragic. The Milady was a B24J Consolidated Liberator, number 42-73134, belonging to the 380th Bombardment group of the USAF based in Darwin. It was towards the end of the war, 17th January 1945, and the crew was returning from an early morning bomb aiming training flight. There are conflicting accounts of the cause of the crash. One is that the aircraft was preparing to land at Darwin but a tropical storm blew in and caused the big plane to lose its bearings. Another account suggests that the aircraft caught fire while still airborne as a result of the blast from a low level bombing run. Either way, it crashed a few km short of the airbase in heavy jungle. The wreckage was located the next day but all 6 crew members were killed. They were subsequently buried in Adelaide River War Cemetery and after the war their remains were repatriated to the USA. 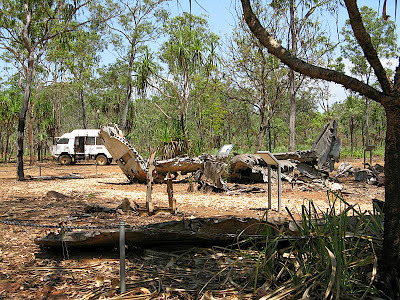 On the 18 Dec. 2002, the Northern Territory government held a ceremony to officially re-open the crash site after extensive upgrading of access arrangements and signage, and to dedicate the site to the memory of those who died there. A letter of appreciation from the President of the USAF 380th Bomb Group Association was read out to the attendees. The crash site is now an official Heritage Site so it must be treated with due respect and left in place as a memorial to the crew who died there. 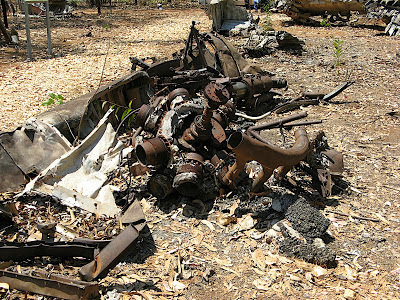 Parts of the aircraft are still very recognisable even after 70+ years in the bush, even though the wreckage was badly burnt in the crash and subsequent bush fires. Note: Getting to the crash site is not quite as straight forward as it seems. 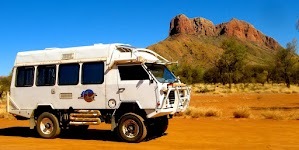 I am not aware of any public transport within Mandorah so you might need to make arrangements before going with a local tourist operator or at the Mandorah Hotel to organise transport to the site. A Minibus service may be available. Alternatively you can take a pushbike or motorbike on the ferry and do a leisurely ride up to the site. It's about 8 km along a quiet bitumen road and then a further 1 km along a bush track. 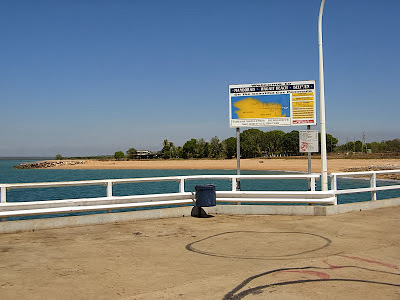 Or you can always drive around the harbour from Darwin and make a day trip of it, (it's around 140 km each way), or stop off at a few of the places of interest on the way, like we did, and take 3-4 days. 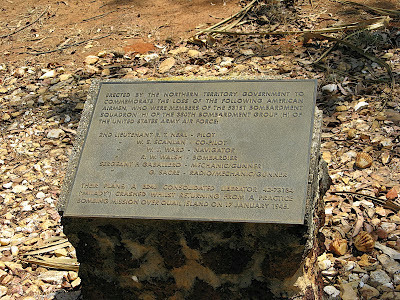 At the site, which is approximately 50m across, various memorial plaques and interpretative signs have been erected to assist in identification of the various aircraft parts on the ground. The chain around the site prevents vehicles from encroaching on the aircraft remains but there are no other access restrictions. The heat of the resulting fire melted the aluminium fuselage structure into blobs of molten metal on the ground, but the tail planes, parts of the engines, wings and undercarriage are reasonably intact. From the orientation of the undercarriage, the wheels had not been lowered at the time of impact. After visiting the crash site and reading about its crew, which is a pretty sobering experience, we took a walk on Wagait Beach, where WW11 gun emplacements can be seen. This was followed by lunch and refreshments at the Mandorah Hotel, before starting the return journey to Darwin. While we enjoyed our visit to Mandorah, we could not easily erase the reality that loss of the Milady was another example of the sacrifices our American allies made in the defence of Australia. Cynics would call it the defence of America but I doubt the forces involved saw it from such a detached perspective. Either way, American lives were lost in our country, for our long term freedom, at a time when the invasion of Australia was a real and serious threat. As a related side note, a USN destroyer, the USS Peary, was sunk in Darwin Harbour by Japanese bombs, on 19th February 1942, during the first of their 60 air raids on Darwin, with the loss of 80 crew members. Their bodies still lie in the harbour which is classified as an official war grave. Overlooking the harbour, at the USS Peary Memorial, and pointing at the exact spot where the Peary still lies, is one of the 4 inch guns which was salvaged from the wreck. We met a party of Americans there who had come to Darwin especially to pay tribute the their fellow sailors lost in that battle. 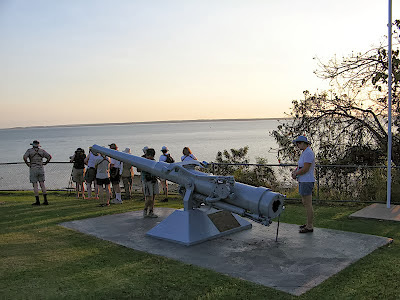 The USS Peary Memorial, the East Point Military Museum and Darwin Aviation Museum with its B52, are also well worth visiting while in Darwin, along with the comprehensive wartime memorials scattered along the leafy Bicentennial Park on the Esplanade near Parliament House. We quite enjoyed Mandorah, despite its sad memories, and even went back there with friends for dinner on our last day in Darwin. We took the 6 pm ferry, ate a leisurely meal at the hotel in lush tropical surroundings and then caught the 8.20 pm ferry back to Darwin. It was a good and interesting night out to round off our stay in Darwin. We were quite surprised that Mandorah hasn't yet taken off as a yuppie commuter suburb of Darwin, as it's only 12 minutes away from the CBD but still very quiet and unspoilt. A day trip Mandorah would be a good day out even if it doesn't include a trip to the crash site. Ferries run hourly from 6.30 am till 10 pm (midnight on Saturday) and the evening and night views of Darwin city across the water are quite stunning. Thank you so much for publishing photos of your journey there .... i travelled to Darwin, took the ferry across to Mandorah, all without realisimg that the crash site was too far to walk in the heat (until some kind locals pulled me up alongside the road and told me so). My journey ended early and i reluctantly headed to the pub. If i had read your blog earlier i would have known to bring a bike!